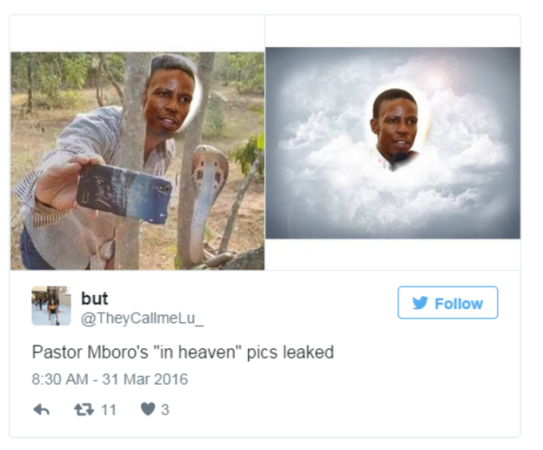 Prophet Mboro sells pictures he took in heaven to Church members. This man is a clown.I watched the controversial Prophet on BBC once.And he was asking church members to bring their underwear to church so he could cast out the demons.Nothing he can do can surprise me anymore after that.At least so i thought.But he takes the biscuit in his new adventure. show as proof! The incident happened at the Easter Service in Johannesburg, but people from as far as Pretoria testified that the sky somehow looked different around 10: 30 am that Sunday. “The selfies i took last night in heaven though. You will be surprised” he posted on Facebook on April 1st…and you would you think it was April’s Fool joke but he was actually very serious! According to local reports, members of the church witnessed the great deed, and were awed to watch the controversial prophet ascend into heaven. Before then, he’s been fasting for 4 weeks and reportedly told some of his church members about the incident which he claimed was revealed to him while he was fasting. Prophet Mboro was about to commence his sermon during an Easter service in Johannesburg when an unusual light flooded the gathering and transported him to God’s kingdom. In a statement released to the media, a senior member from Mboro’s church said that Mboro is being rewarded for being an honest servant of God. However, those who wish to see photographic evidence of the afterlife will have to pay as Prophet Mboro is allegedly asking for a donation of 5,000 rand (about $340), BBC reports. On March 31, he wrote on Facebook, “Tonight at 10pm i ll post one picture i took when i went to heaven. People have despised me alot. The one who wants to get it first inbox me and pledge atleast R2000. 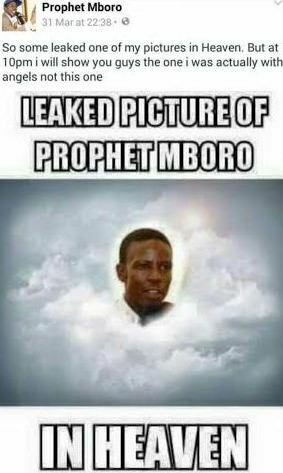 That same day, he posted a photo with a caption “Leaked pictures of prophet Mboro in Heaven” claiming that someone leaked one of my pictures in Heaven. 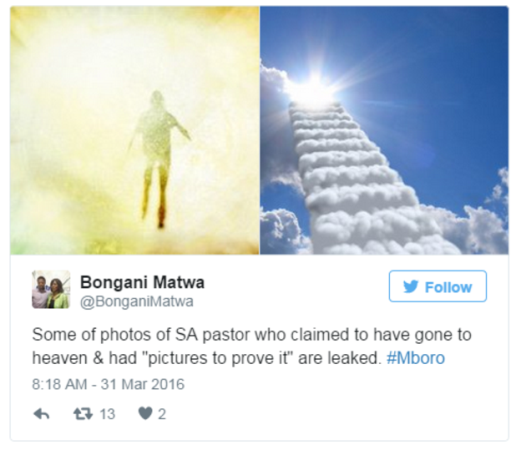 “So some leaked one of my pictures in Heaven. But at 10pm I will show you guys the one I was actually with angels not this one” On April 2, the prophet posted another photo and said he took it. “Woke up this morning and saw this. I just had to take a picture” he captioned the photo. BBC NEWS reports that South Africans are ridiculing the prophet. 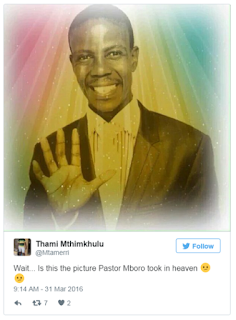 “If the Americans can go to the Moon why can’t Pastor Mboro go to Heaven and take pics,”one tweeted. Another commented: “Don’t forget your selfie stick when U go to heaven.” For those unable to afford the donation, see some of the speculation online about what the photos might show.